Buckeye chickens are a good dual-purpose bird and is very cold hardy. They have a pleasant demeanor. Size: Standard Male: 9 Ibs. / Standard Female: 6.5 Ibs. / Bantam Male: 34 oz. / Bantam Female: 28 oz. Comb, Wattles & Earlobes: They have a small to medium-size pea comb and well-rounded wattles and earlobes. All are bright red. Color: The beak is yellow shaded with reddish horn and the eyes are reddish bay. The shanks and toes are yellow. The plumage is a rich and lustrous reddish brown or mahogony, though the tail does contain some black. Most of their under color is a bright red, but with a slate colored bar on down the back. Special Qualities: They have a calm demeanor and they are a good dual purpose bird. The breed has the distinction of being the only breed that a woman is credited for developing. This prize goes to Nettie Metcalf, who was an Ohio farm wife. More women than Nettie probably had more to do with developing breeds than actually got credit for though. Through the 1800's women were the primary keepers of poultry on the family farms in the United States. 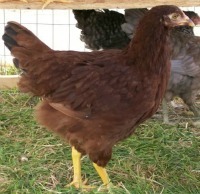 Metcalf crossed Barred Plymouth Rock hens to a Buff Cochin rooster, and then added some black-breasted game fowl to get a functional, dual purpose bird that would perform well on the farm. These birds are a good choice for a backyard setting. They are known for their meaty thighs, wings, and breast and have very dark "dark meat." They are also calm birds who tend to take to their caregivers. The occasional rooster may be aggressive, but not very often. They are good foragers and can be free ranged, but can adapt to confinement as well. They are very hardy and venture out even in the coldest days of winter. They are one of the best breeds for cold weather and the only American breed developed in the United States that has a pea comb. The breed was recognized by the APA in 1904.